It’s evident that a ridiculous amount of work has gone into the making of this release by spending just a few minutes with it. Every UI element is polished to perfection in the app. The attention to detail in elements like the loading indicator which also works as a progress indicator is marvelous. The app is a great tool to have for anyone who is into servers or just a fun tool for average consumers who want to keep an eye on their iOS device’s data. Four years later and a couple of months ago, Bjango quietly released iStat 3 — an evolutionary update to the already stellar app. Version 3 introduces a whole lot of improvements, but also takes away some good features available in the previous version. iStat 3 has been (almost) entirely rewritten from the ground up, and with this release, it also makes its debut on the Mac. The app has undergone visual changes and UI improvements to bring it in line with today’s standards and true to Bjango’s style, both the apps look absolutely stunning. It also now supports OS specific features found in macOS, Windows, Linux, FreeBSD and other OSs. 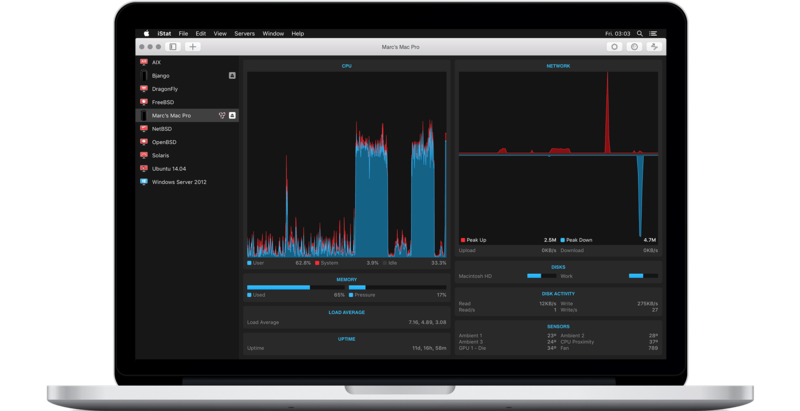 iStat 3 also introduces the two essential network tools — Ping and Traceroute. On the other hand, you can no longer view your system stats of your iOS device in the app like in iStat 2. You must add a remote server in the app. Your list of servers syncs via iCloud across all your devices, and this syncing has been improved as well. iStat 3 for iOS is a new Universal app and is available for $4.99 on the App Store. iStat for Mac (Version 3.x) makes its debut for $9.99 on the Mac App Store. Both these apps require the free iStat Server component to be installed on the remote server. If you’re looking to keep an eye on the stats of your own Mac, you should take a look at the equally stunning iStat Menus instead.